In this 3rd Grade project we find that the Bunny family is posing for a family picture and we have caught them in the act. Spring flowers and decorated Easter eggs make the family picture a keeper. We start out with five large circles and go step-by-step to make our drawing. There is just enough direction to give the kids ideas, but no real rules. 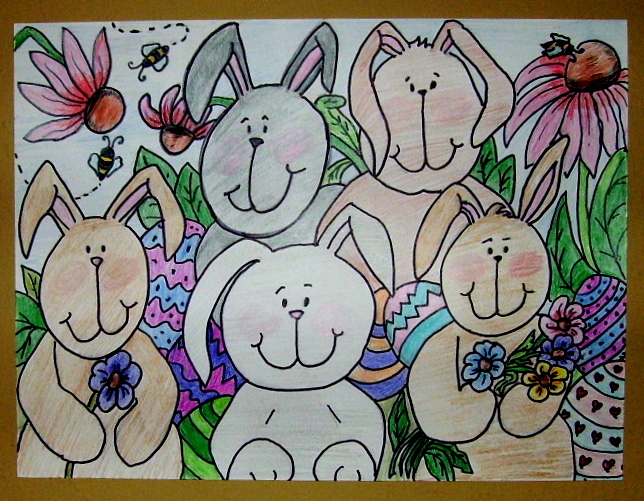 Directions for, “Bunny Family,” can be found in the 3rd Grade Projects Gallery in the sidebar. Click on the photo on the left to see the whole picture. This entry was posted in 3rd Grade, Easter and tagged 3rd Grade, art, bunny family, easter art, easter art project for kids, easter bunny, easter bunny family, easter eggs. Bookmark the permalink.